Join Director Sean O’Harrow and supporters of the Honolulu Museum of Art on a contemporary art tour to Japan! We will be visiting Kyoto, Naoshima and neighboring islands, as well as Tokyo, from Nov. 10-17, 2019. This trip promises to be an unforgettable tour of artistic textures and styles that highlight Japan’s beautiful craftsmanship and groundbreaking contemporary art. 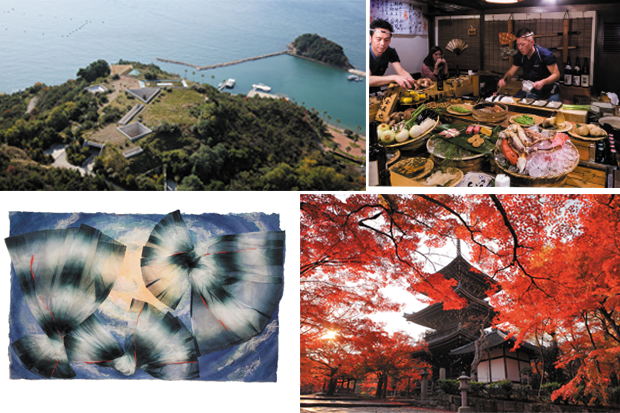 November is the perfect time to view the changing fall leaves in Kyoto and we will provide time to enjoy the spa and serene art landscape of the renowned contemporary art destination of Naoshima Island. We will travel by bullet train to the bustling capital of Tokyo, where we will learn about the evolution of manga from the traditional woodblock prints to today’s popular books and videos and experience the fanciful and eclectic subculture fashion of the Harajuku district. Private studio and workshop visits with contemporary Kyoto artisans of ceramic and washi-paper textures. View the changing autumn maple leaves of the fall in immaculate temple gardens of Kyoto. A two-night stay on Naoshima Island at the famed Benesse House with private tours during the day to major art museums and site-specific architecture on Naoshima, Inujima and Teshima islands. Special guided tours at the Mori Art Museum, Museum of Contemporary Art and newly opened Yayoi Kasuma Museum in Tokyo. An architecture tour through Omotosando of the luxury designed retail stores, and into the heart of the Harajuku district to witness the expressive eccentric fashion with a Harajuku ambassador. An exploration of food from traditional Japanese kaiseki or ‘set menu’ dinners, European influenced fusion dishes, to robatayaki or ‘fireside barbecue’ cooking. See the full itinerary for more details. See the full itinerary for more details. Reservations and a deposit must be made by Feb. 1, 2019. The trip will require a minimum of 32 individuals to secure the listed price. If you would like a printed version of the itinerary or if you have questions, please contact Ching Jen Lum at gro.muesumululonohnull@mulc or at (808) 532-3671. What is the level of activity,e.g. easy-moderate-active, etc. The level of activity is moderate – we’ll be taking buses everywhere to each of the locations, but if we’re at a museum for a tour there generally is a bit of standing and walking for that hour or so. Patrons are also welcome to skip parts of the itinerary if they so choose, just need to communicate with the staff their plans.